You see, the doors just came back from the Door Hospital. They underwent a veneer repair, sanding, staining, and refinishing. I was terrified that they would not survive the anesthetic. But they are back! And GORGEOUS! 1) Paint porch ceiling and door sill. 2) Install matching porch light to left of door. 3) Remove electric outlets above porch light. 7 Responses to My Doors Are Back From The Hospital!!!!! Every time I see beautiful Victorian doors a pang of pain runs through my heart. A friend of mine passed on a set his neighbor was taking out. They are weathered and (I think) will need to be painted from now on. They wouldn’t fit my opening anyway, but I long to see them on his house. Hi Chad! 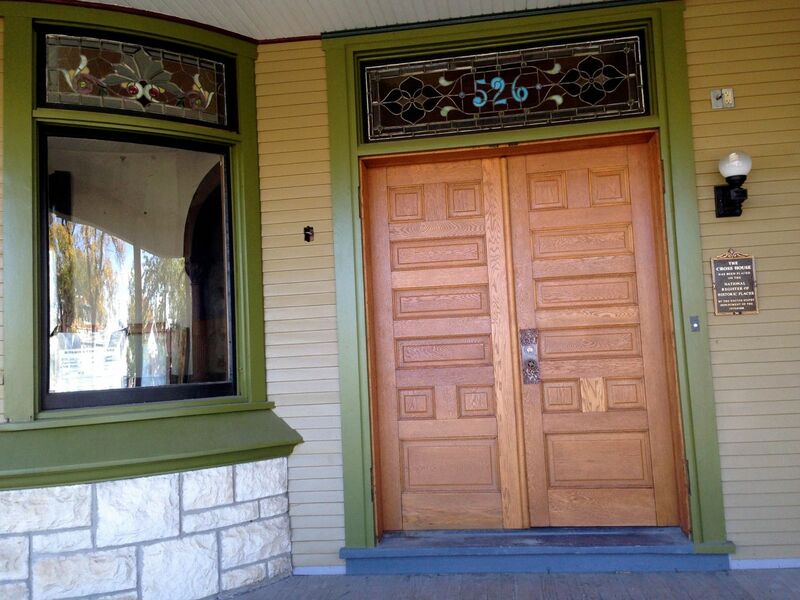 Yes, I am thrilled that the original front doors, both pairs, are extant. I do love that word: extant! Did the Cross House have a doorbell originally? Is that it in the photo? I do not know if the house had a doorbell originally. The one in the image is not original. I think you should have an old door bell installed. Something with a string to pull, perhaps? Hi Ross the receiving doors are one of my favorite things of yesteryear the 1903 beauty I rattle around and volunteer at has them and because of your post I get to educate people about them. It’s so fun showing people the craftmanship and explain people’s way of thinking back then. I also tell everyone about you and the Cross House. Thank you so so much for sharing your home,knowledge and passion of this beauty and other old homes with the world, I have learned more from you and your blog than I dreamed possible.